← Who Says Kids Are Out of Touch Because of their Techie Toys? About a year ago Michael Davias shared with me his Excel spreadsheet pertaining to the Carolina bays. And what a spreadsheet it is. The amount of work Michael put into locating and quantifying their locations and sizes and alignments boggles my mind. It was, as I understand it, tied in with his LIDAR work on the bays. And without LIDAR, probably the majority of the bays simply are not find-able. The two – LIDAR and the data – go hand in hand, but the numbers of bays is really up there, and to think that he was able to extract so much precise data about the bays is just mind-numbing. My hat goes off to Michael for doing so much foundational work. So the world now has a fairly precise count of the Carolina bays. It is not half a million, as some have speculated. It is 43,900. But 43,900 is still a LOT of bays. It is also a very large database from which to derive statistical meaning. How many types of bay planforms are there? Five types exist in the eastern USA. Michael gave the three types the names BayCarolina, BayBell, and BaySouth, bayShore, and bayOval. A sixth type regardless of shape is called BayWest, strictly on location – out in the Great Plains. What is the size range? The largest one is 7.95 km x 6.19 km. The smallest is 0.03 km x 0.03 km. The farthest north bay is at latitude 41.76°N; the farthest south is at 30.79°N. The farthest east is at 72.80°W; the farthest west is at 100.80°W (in the Bay West group. Of those in the eastern USA, the farthest west is at 87.62°W. Michael looked at them by their azimuths and determined that there was a single centroid for them all. I won’t go into what conclusions he came up with. But it is west of Saginaw Bay. His work covers that. I did it another way – and came up with almost the same answer. So both azimuth-wise and distance-wise, the same area seems to be the center of the Carolina bays. I decided to look at them from another point of view – to see if there was a centroid based solely on distance. They LOOKED like the formed an arc, and having done design work, sometimes it was necessary to find a center for some points, so that part is a piece of cake, usually. The distances from the Centroid to the center of one of the bays I ended up giving the name of “centroidal distance“. In doing so, I initially thought that there would not be anything to come from this. It was solely as an exercise. Find a center and find out that it didn’t really mean much. I thought there could be a bell curve to the charted centroidal distances, but if so, it would only by some strange happenstance. Recall this first: All of this is empirical evidence, real-world, measured numbers. Like in real science. Davias plotted the geographic locations of the bays, and all of this is real, quantified data, measured from real bays found on LIDAR. The LIDAR accentuated and made clear so much about Carolina bays that it not only showed thousands that were essentially invisible on maps or in person, but it also mae measuring them much easier and more precise. All I was doing was looking to find a best-fit centroid. Davias did all the real work. My toying with it was simply to look at the distance of each bay from some centroid. They looked like they had a central radiating point, but DID THEY? Yes, in fact, they did. Double WOW. Now THAT is a helluva spike. It’s a nice, really tight set of bell curves, and all the main ones peaking at the same distance from the Centroid. There does appear to be ONE point, the Centroid of the arc of the Carolina bays. That centroid is geographically very close to Davias’ azimuthal centroid – a very interesting finding, considering that the centroid is on average about 1240 km away from the Eastern bays. DO note that not only are the peaks of the main types within the same VERY narrow 1200-1250 km range, but the drop-off on either side of that rang is quite steep. This appears to tell us that, if the bays are secondary impacts from ejecta, then most of the ejecta was lofted with very nearly the same energy and velocity. There is NOT a lot of variation. 97.4% of the bays in the eastern USA are within a 250-km band from 1150 km to 1400 km. This in itself is a very narrow band. Again, consider how far away the Centroid of this data IS – 1240 km on average. This all argues very strongly against any local causes. Alternatively, it argues that anyone pushing local causes has to then take the extra step of explaining why there is a Centroid out in north central Illinois that is mathematically tied to the locations of at least 97.4% of the eastern Carolina bays. The mean of all Eastern bays from the Centroid is 1239.057 km. The mean of the (Eastern) bayBell bays from the Centroid is 1223.757 km – only 15 km from the overall mean. 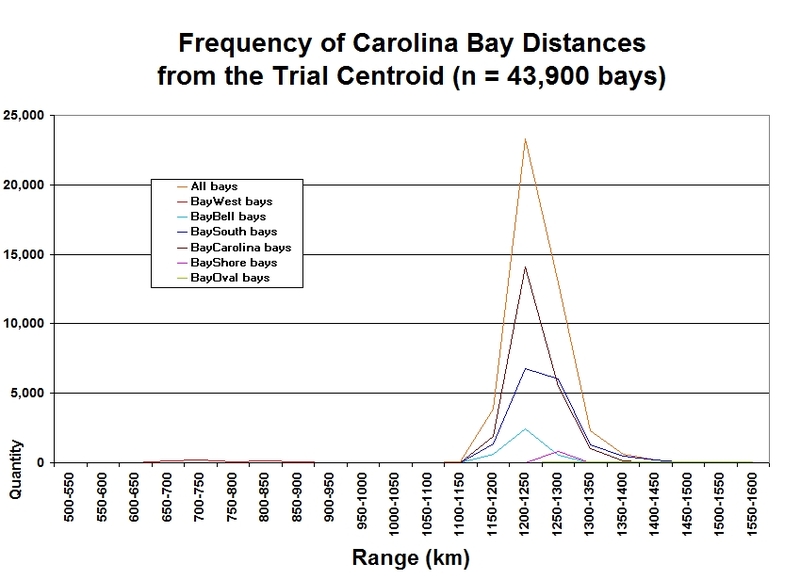 The mean of the (Eastern) bayCarolina bays from the Centroid is 1238.254 km – only 0.8 km from the overall mean. The mean of the (Eastern) baySouth bays from the Centroid is 1255.150 km – only 16 km from the overall mean. The mean of the (Eastern) bayShore bays from the Centroid is 1271.285 km – only 32 km from the overall mean. The mean of the (Eastern) bayOval bays from the Centroid is 1264.711 km – only 26 km from the overall mean. ALL Eastern bays fall within the range of 1050 km to 1450 km. Now, I was hoping to see something that could be construed loosely as a bell curve, a “normal distribution curve”. What I got was a set of very narrow bell curves – for nearly all of the Eastern USA Carolina bays. Essentially, something like 98% of all eastern bays are within the very narrow range of 1100 km to 1300 km. If you look very closely at the chart above, you will see a reddish line between about 650 km and about 900 km. That is the BayWest type, out in the Great Plains – the Western bays. They are all much closer to the Centroid than the Eastern bays. There are very few of these – only 1.355% of the bays that Davias using LIDAR was able to find. Davias has a map that shows why there are not more, consistent with his hypothesis. And that map shows that the Laurentide Ice Sheet extended down to the northern edge of the bayWest bay area. Thus he represents his argument that the other ejecta toward the west landed on the ice sheet and was erased at or before the time when the ice sheet retreated. The Centroid for the 43,900 bays, based upon a common distance, is at 42.289867°N, 89.405583°W. That does not quite line up on the same latitude with Saginaw Bay, which is at 43.91666°N (and 83.58333°W). 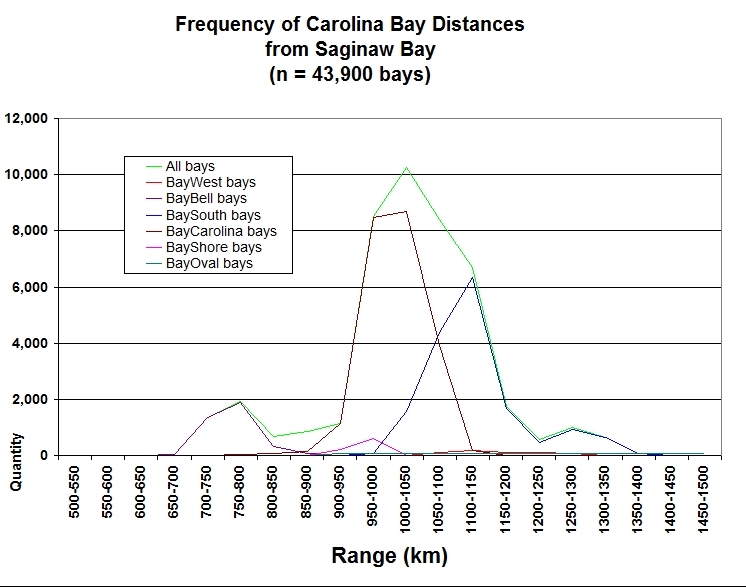 Davias had argued – and I agree with him (especially now) – that if the Carolina bays are secondary impact craters, then the Earth’s normal rotation eastward during the flight of the ejecta materials would present a researcher with a “proxy” impact site, somewhat west of Saginaw Bay. If it hit in Saginaw Bay, then Saginaw Bay would rotate eastward, but the arrangment of the Carolina bays would point to a location west of Saginaw Bay. This would be true no matter which method of finding a Centroid is used – his or the one here. His centroid is in south central Wisconsin. The method used in this post arrives at a centroid in north central Illinois. The two are close enough that perhaps with further analysis they can be merged or one can win out. I have no idea which would win out. The Earth is assumed here for convenience to be spherical with a diameter equal to the mean between the polar diameter and the equatorial diameter. I used the value of 12,734.92 km. Initially it was assumed here that Saginaw Bay (43.91666°N 83.58333°W) was the Centroid, to see if there was a pattern worth pursuing. If this had give no interesting results, the inquiry would have ended there. It was assumed here that there would be a Centroid other than Saginaw Bay that would probably give better results, but where that might have been was up in the air. I assumed that, if Davias was right about the rotation of the Earth while ejecta was following some trajectory, then the Centroid would be to the west of Saginaw. So that is where I focused my attention – right or wrong. The methodology of locating the location of the Centroid was mostly trial and error, entering new coordinates and seeing how the curves changed. The closer I got to south central Wisconsin/north central Illinois, the tighter the bell curves became, plus the secondary peaks on the curves (on each side of the peaks of the bell curves shown in Figure 1 above) went away. 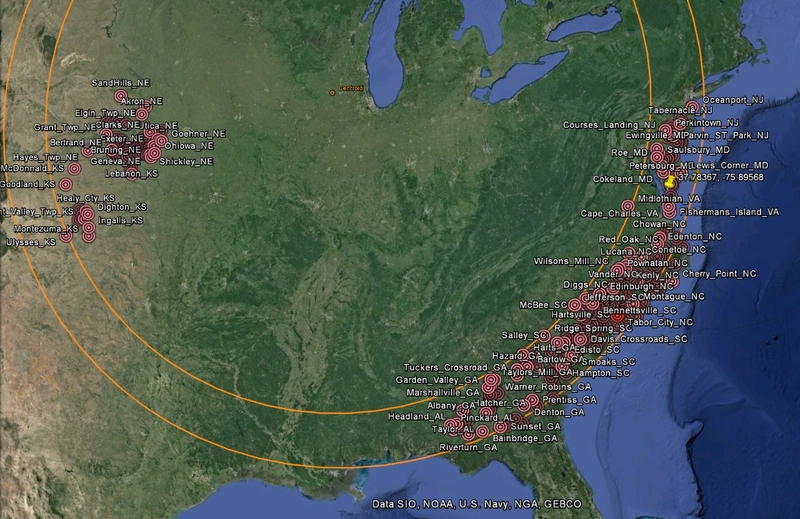 With this much consistency of distances – this narrow range – it is very difficult to argue that this Centroid is not somehow intrinsically connected to the Carolina bays in the Eastern USA. But what IS the connection? If it is not an ET impact in the northern part of Illinois or nearby, with secondary impacts mostly near the US Eastern Seaboard, then what else might connect them? Absolutely nothing else comes to mind. [Added 2015 Dec 9] Seeping hydrogen gas has recently been reported in a scientific journal to have been found in and around the Carolina bays in North Carolina. How such seeps might tie in with some distant centroid (me) or angular centroid (Davias), I can’t imagine. Wind and water have always been acknowledged to exist in the bays as secondary forces, causing re-working of bays and bay rims. But as far as originally forming the bays, these two fail to explain how they could have made the bays in the first place. This has been covered elsewhere and is not one of the subjects of this blog post. Davias, in particular summarizes these and other failed bay formation explanations. Thus, in the scientific literature, the formation of the bays remains unsolved. This blog post is written as much to simply add evidence as to try to explain the bays and their mysterious genesis. The ET impact origin for the Carolina bays has long since been discarded, because all known impacts were of a hyper-velocity type, with very high energy levels, very high temperatures, and very high pressures involved. No such evidence has been found in the area of the Carolina bays. Nice article! I have been cruising the carolina bays (LIDAR and automobile, and yard) for years and just discovered your site. My big queswtion is this: when were the bays formed? Now this may seem like a difficult answer. But I think we can nail it to a definite time zone. I am starting to prefer “between 590AD and 1014AD” due to research I recently stumbled over about the upper east coast USA and reports from the other side of the atlantic. I would love to discuss this further sometime if you would. Rick – Many apologies. Even though your comment here was approved, I don’t recall seeing it, so I am just now getting around to replying. Yes, this IS a difficult question to answer. So difficult that the range of answers researchers have come up with range from about 13,000 years ago to 780,000 years ago. In other words, no one knows. And here are YOU, suggesting 590AD-1014AD. What was it that you stumbled across? It might tie in with some (other) impact events that some think may have happened. And it ties in with events on the other side of the Atlantic? Steve; Earlier you spoke of the impacts possibly causing the earth to shift to the south to align Pecatonica and Saginaw Bay. This in relation to the Carolina Bays alignment. The shift you propose would have to have happened after the fact though the earths spin could have brought the present locations into being. Another thought is that it has been proposed that there were more impacts over the globe at that time than just here. Possibly one other at another location on the globe was slightly earlier and strong enough to cause a wobble just before Saginaw impacted and set up the alignment we see and then returned to its normal positioning. Definitely hard to prove at this time. Maybe you should try GO Fund Me for research monies, you never know! Okay, first, I need to contemplate what it would mean that Pecatonica and Saginaw were on the same “pre-latitude”. Bear with me, because I am addressing this cold, and just going on my innate spatial sense (which isn’t bad, BTW). My first thoughts, then are that the motion would have had to go FROM Pecatonica TO Saginaw, whether in one motion or two. Also, it would have meant two impacts large enough to DO the moving. Can I live with two? My OWN thinking was that the two forces involved were 1.) The impact, and 2.) The Earth’s rotation. I saw this as a vector addition problem. (In the middle of all of this, BTW, is Tim Harris’ and Michael Davias’ idea that the Saginaw impact wsa tied to the Australian Tektie field and dated to 780,000ya. It is not possible for both to be true – theirs and mine. The time element is clearly different. At the same time, I don’t think theirs and mine are necessarily mutually exclusive. Why not? If one looks at Peter Schultz’s hyper-velocity experiments, it is clear that there are two patterns of ejecta – one vertical and downstream, and the second, slightly later one that is the butterfly pattern of the CBs. THEY also think this, putting the CBs at 780,000ys. For mine to work, I need to have both at 12,800ya. At the present time, they are two big brains and I am just me, so it should be me caving. But I don’t think the 780,000ya date is correct. So I am still on their side, except not all the way. For one thing, I don’t think it possible that the CBs could exist for more than 3/4 million years in the state they are in. That much time would have eroded them away, IMVHO. Everything about them screams YOUNG age, not old. Michael Davias insists the CBs are durable and not delicate; I congenially take the opposite position. So, two impacts or one? Yeah, all of that is possible within what I was conjecturing. Though that is not where my head goes. So far, I think that it was only one impact, but multiple biggies may have occurred – but that makes it even more difficult to come up with multiple impact sites, rather than one. FYI, one of the things that I think an impact-driven polar movement can, if done right, explain WHY the Magnetic pole is not at the geographic pole, AND why the magnetic pole is still wandering. I think it possible that the wander is because the movement caused some instability between the lithosphere, the mantle, and the core – and that it is all still trying to realign, after only 13,000 years. Jim, you have NO idea how big this whole idea is. I find possible evidence in the eastern Himalayas, as well as in Northern Europe, and in the Mayan areas of Mexico and Guatemala. I ALSO have to address what level was the shear plane, if the crust moved? Was it just below the crust? Or was it deeper, at the mantle-aesthenosphere level? And another one is that I think the movement actually broke off smaller pieces of the NA and SA plates, when they were crushed together – creating the Nazca plate and the Cocos plate, to name two – and create oceanic troughs and the instability of the plate boundaries. Right now the thinking is that the subduction has been a slow and gradual condition for many millions of years, but mine says that much of it is recent. And THEN there is the paleo-gravitational issue (which Hapgood addressed and I need to, too) – was there a magnetic excursion at that time? And if so, does that mean that other excursions were caused by impacts?. Each one of these possibles I need to both explain my thinking and deal with what is currently thought (and I totally have to LEARN what is currently thought and compare it and see how their info can help me – I can’t be sloppy about ANY of it, or I will be laughed out of town). People are going to come out of the woodwork and yell and scream about ANY particulars that don’t conform to present thought. This thing is HUGE. As you would expect, if the Earth’s lithosphere moved, of COURSE it is big. Jim, I don’t need money for doing this, not the way I am doing it right now. Yet would field work help? (which would require money, yes?) Right now I am not thinking that, but some field work would not HURT. At the same time, you may have hit upon something that researchers from universities should try. Why shouldn’t they? I am sure they could raise a lot of money for site work, perhaps far above what they currently do. Steve; I will encourage any fool who has an idea that makes their brain burn, That’s why the species is where we are today. Thinking in the same vein if what you are conjecturing can be proven or at least validated and I can prove out my Drake Passage 4 impact trail can you imagine the crustal movement those 4 whoppers would have had! A thought just crossed my mind. One way to possibly prove or disprove the stability (longevity) of the CB’s would be to go there real soon and look to see if there has been much erosional activity since all the heavy rains and flooding of late. Another thought on the subject of Bays is that there does not appear to be any kind of heavy soil cover layer over them. George’s pics and other descriptions to not mention any real cover soil depth. To me that says new, not old. When were the bays formed? Trust me, the dates are ALL over the place. Your dates are by far the most recent, and if you’d care to talk about your reasons in full, go ahead. I just talked with Davias (for the first time) 2 days ago, and he and Tim Harris put two and two togeher and have concluded that the bays were formed 780,000 years ago, at the same time the Australian tektites were formed. That is also the time of the last big magnetic reversal. I’ve heard 13,000, 30,000, 40,000, and 130,000. The dating methods used have come up with widely varying times. C14, OSL, etc. – nothing solid and all contradictory. In my mind the problem is WHERE to take samples. Inside the bays? On top of the rims? Under the rims? The bays and bay rims and outside the bays, too – all are covered with a layer of quartz sand. That cannot be dated by C14. It should be perfect for OSL, but for some reason the dates come up all over the place..
NOBODY knows yet. Anybody who says they know, they are stroking you. And themselves. I myself prefer the 13,000 date. Partly because I see reasons to connect the bays – and Saginaw – to the Younger Drays boundary at 12,900 years ago. But those connections I can’t make with solidity. The weird thing is that no one ELSE has been able to date them well. So I keep up some hope of that YDB connection. But it is just an opinion for now. Hey, I just got back from IL day before yesterday. It was GREAT meeting you and your wife. Time flew by while we talked, didn’t it? The “craters” in Lake Michigan were addressed in Richard Firestone’s book, The Cycle of Cosmic Catastrophes”, but so far I haven’t seen any follow-up to speak of. He was talking about basins that extended fully across the lake. As to the chemistry of Saginaw Bay and northern IL/Southern WI, I think maybe I didn’t make it clear. Because of the rotation of the Earth WHILE the ejecta was in flight, the CBs – distance-wise – “point” to No. IL – but that does not mean that the impact was there in that location. It is a “virtual centroid”, in that way. It is only a mathematical point. The real impact point SHOULD be due east of the virtual centroid. However, Saginaw is NOT due east of my virtual centroid. What does THAT mean to us? it means, first of all, that it is more complicated than simply finding a point. I am not sure what direction to go in from here. Any adjustment factors need to be Real, not just convenient to arrive at a Saginaw-No. IL connection. ONE connection – kind of tin foil hat, perhaps – is my conjecture that the impact may have been strong enough to cause a pole excursion. This would put Saginaw EAST of Pecatonica at the moment of impact, but that both shifted into the present alignment because of the impact. In this scenario it would not be that one pivoted around the other, but rather that BOTH moved, but that one moved north or south more than the other. Given the assumed direction of the Saginaw impact, that would mean movement toward the south, not north. One thing I’ve perhaps mentioned is that big earthquakes are known to have slowed the Earth’s rotation, so one would expect at least SOME shift in the Earth’s normal rotation if an impact hit. And if an impact or quake can shift the Earth east or west, it seems to make sense that a diagonal impact could shift the Earth’s motion SOUTH or north, too. That would be a matter of trying to extrapolate from quake shiftings up to an impact energy level required to shift the Earth, say, 1°. All of this is speculative, but there is enough semi-reasonable logic to it that I can’t let it go. Let it go and wait – and SEARCH – for further information. But — in what? a half hour? Assuming a really really fast missile? How much rotation does the Earth have in that half hour (i.e., to affect the landing location of the boloid) — and wouldn’t the ice shards be flyin’ way faster? (Hmmmm, so Earth rotation at 500 miles distance in a half hour) but how long do you think the shards would take to reach the Carolinas? Elenor, the Earth rotates 360 degrees every day, 24 hours. So that makes it 15 degrees every hour, right? Then that makes it 1 degree every 4 minutes. So, if the ejected material flies 1200 km, on a relatively high arc, that takes SOME time. If the ejected velocity is, say, 7 km/sec, then let’s assume a ground velocity of 4 km/sec. 1200 divided by 4 = 300 seconds. That would be 5 minutes. If the Earth rotates 1 degree in 4 minutes, then in 5 minutes it’s going to rotate 1.25 degrees. Once anything flies up – even if it is straight up – the Earth does keep rotating, and the landing location will be shifted. Time equals a change in longitude. ANY amount of time. The Russian missiles DID have to account for this, as did ours. Once you loft the missiles or ejecta, you don’t have any steering (or at least the early missiles). Certainly ejecta doesn’t. Steve; When looking at relief maps of Lake Michigan there are 3 distinct circular depressions that go from the East to the West shores over the length of the lake. If these were to be confirmed as impacts ( not all round impressions are craters. Stephan Dutch) and dated to YDB one could talk about there being a cluster impact versus a single bolide hit. This might also take in Dennis Cox’s Minnesota site. A multi impact event might give more credence to the Kankakee Torrent happening because multi hits on the ice sheet perimeter where the ice is already compromised by melting would lead to massive fracturing and flash melting of the ice. Another effect of the impacts would be the movement of the fractured ice away from the ice field forming moraines to some what funnel and combine the melt waters to create the Torrent as we know it. If you decide to come north again over the holidays let me know and maybe we can make a day of it. That would be great. Steve; I went and looked up the position of the Laurentean ice sheet 12000 yrs. ago and found that Pecatonica was never even under the ice sheet. At its max the ice never got to Rockford. At the time of the YDB the ice had been retreat for 10-12000 yrs. already. So the ice that was present was not good quality ice and any impact(s) would definitely cause major flooding and ice movement after the fact. I believe the closest ice 1200 yrs. ago would have been around McHenry county. I’m not sure what this would mean to your Pecatonica to Saginaw crustal idea but I thought it might be of interest to you. Since there are no known craters on the ground in Northern Ill. Lake Michigan – Saginaw should be the next alignment to consider. That was a good thing, for you to go and look up where the ice was and wasn’t during the LGM and later. The ice at the time of the YD was NOT as advanced as the LGM. The LGM ended about 22,000 ya, and the two warm periods after that were the Bolling and the Allerod, and the YD came at the end of the Allerod – a warm period, when the temps weren’t so very different than now.. The ice had already receded considerably. Pecatonica was only the VIRTUAL impact site (according to the distance data I used on the 43,900 then known CBs. By virtual, I mean the point that APPEARS to be the centroid. But the REAL impact point was not at Pecatonica. The Earth rotated while the ejecta was in flight. During that time, the impact point moved away to the east. The amount it moved depended on how long the ejecta was in flight. But having already left, the virtual take-off point stayed in the same true (3D space) location while the geography moved under it to the east. For every 4 minutes of flight time, the Earth rotated 1°. Thus, the virtual centroid and the actual GEOGRAPHICAL impact point moved away from each other at 1° every 4 minutes. Pecatonica ended up being the final location of the virtual centroid – but the real impact point on the Earth’s geography never changed. And that was Saginaw (according to Davias). If the Earth were not rotating, the virtual centroid and the geographical impact point (the crater, hopefully!) would be the same place. But due to the rotation, the two have to be different. But there is no candidate directly east of Pecatonica. That means one of (at least) three things: 1.) My analysis is wrong; or 2.) Saginaw IS the impact point and the rotational direction got screwed up; or 3.) That the distance data assuming a true circular relationship is not quite correct (perhaps it was more elliptical, relative to the impact point..
Perhaps the real virtual impact centroid was actually due west of Saginaw, after all. That point would also work realtively well as a centroid, though its relationship is not truly circular. The circular workI did was a tentative idea, and certanily not one that I thought would work out as cleanly as it did. But there may not BE any reason for the data to give a circular pattern – it might be CLOSE without being actually circular. After all, there is no reason that the impulse of the impact should give a circular pattern. That would mean that Pecatonica is possibly NOT what the numbers say it is. Time will tell, perhaps. Steve; I realized Pecatonica was not an impact site and I realize that earth spins out from under the site while the ejecta is airborne. My point was that the tilt of the earth could have put Ill and Mich in close alignment with the level planetary plane at the time of impact or just after depending on the size of the impactor (s). I know you’re trying to find if there was a global crustal shift from this event. With the melting of the ice any idea what the crust rebound might have been and would that have any bearing on the any crustal movement? Regarding isostasy (rebound from the ice ages), I am always amazed at how the geologists credit that, when they don’t know JACK about how much was over any point in Canada. Trust me, I’ve LOOKED. Tokin’ my a–! I’m doing atmospheric saturation!! Hapgood has a math guy work out some of this, but the guy made a wrong assumption at one point, so his math is all wrong. And they based it on the “throw” of the centrifugal force of an off-center Antarctic ice mass. But they DID understand that it was possible to calculate what was necessary to break the “crust” loose. Han Kloosterman is convinced that the shear plane had to be at the mantle, though I am not sure what depth he figures it at. But the mass above – what is knocked loose – must be known in order to figure what direction the movement ended up being. The impact direction is one vector; the rotation is another. The magnitude of each vector determines the resultant vector. And after it breaks loose, there is a period of shear/slippage, after which friction within the fluids decelerates it, until it “grabs” again – giving us our present geography, pole-wise. There is a name for this viscous friction, and dammit I can’t remember it now. I was heavy into looking into that 6 months ago or so. There would be SOME effect on the tilt (not much, but SOME), BTW, which needs to be looked into, also. Steve; I checked out the lat. difference between Pecatonica and Saginaw Bay and found they’re only 1.3 degree N latitude different. Now if the earth has a 21-23 Degree tilt from the polar vertical, that should make the difference even greater. I believe that the impact came from the southwest quadrant. If the impact was large enough it could have changed the polar tilt some. Maybe enough to get a close alignment of Pecatonica and Saginaw Bay for a very short time during ejecta lofting. I know you are going to read this and ask your self: What kind of —- is that boy smoking??? It got into my head and just had to come out. Yeah, what IS that guy toking, anyway? !